Starting kindergarten represents a major milestone in the lives of young children (and their parents!). It is an important step into the unknown that while exciting can also be the cause of nervous anticipation for everyone involved. The good news is that it doesn’t have to be scary! ME, WE, WHY, WILL, WIGGLE, WOBBLE, and WHAT IF. I love to move around and explore, so my favorite skill is WIGGLE. I can jump into things, and reach for the stars. And bend and stretch and jiggle! Follow Roo as he figures out how to use and apply his amazing “QI” (pronounced key) skills: ME, WE, WHY, WILL, WIGGLE, WOBBLE, and WHAT IF. With his backpack of “super cool” skills and a head full of questions, Roo is excited to jump into kindergarten, and your children will be too! 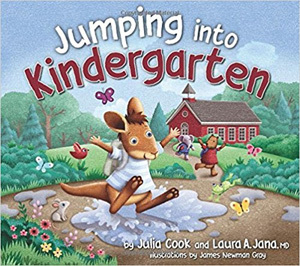 Dr. Laura A. Jana joins Julia cook in this book that helps parents and educators more clearly understand the important connection that exists between everyday behaviors and the foundational development of valuable, 21st century life-skills during early childhood. This book also includes creative, practical tips to implement these skills in the home and classroom. As a Preschool, Young 5’s, and Kindergarten teacher for the last 16 years, I have not come across a book that get’s it like this one. Children who come into kindergarten with these skills will be more confident and parents will feel more at ease. This book beautifully captures what we all know to be true – that who our children become is as important as what they know. A must-read for all children getting ready to start kindergarten…amazingly fun and engaging book that also teaches key skills that will be critical to their success in both kindergarten and life!